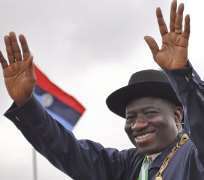 “Therefore, anyone saying that President Jonathan does not have rights to seek re-election is not being sincere and I want to say it categorically that the decision as to whether or not he wants to seek re-election is for the president to make, not one that can be forced down his throat,” he said. While calling for restrain among politicians, Senator Arise said; “The reality is that whether the president runs or not, there will always be struggle for power. “But the question we should be asking is that; those people in the opposition party that are moving around, do they have something better to offer Nigerians? “All these noise here and there, are they about development of Nigeria and its people or about power, power and power? “Politicians in Nigeria should therefore be guided by the laws of the land and desist from heating up the polity unnecessarily just because of quest for power. “In Ekiti State for instance, there is a monster that is called ‘see and buy.’ The people in government now introduced it during the 2011 elections. Now it is the mentality that if you must win election in Ekiti, you must be loaded.